Is it possible to create a shape space similar to the colour space that grabs all shapes and forms a compact whole? This was a question that intrigued me. I was particularly very curious about how that shape space would look like, and if it was anyhow possible to make such a thing? 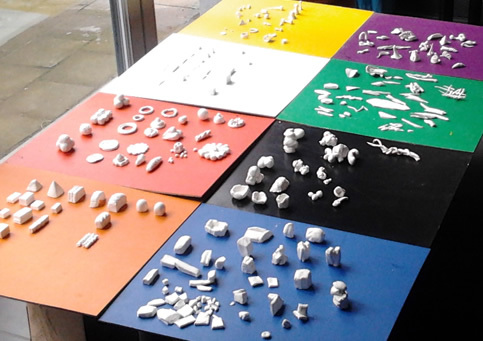 I started by creating three-dimensional shapes in modelling clay. The collection is a mix of random and order. Everything I came across as a shape I copied. 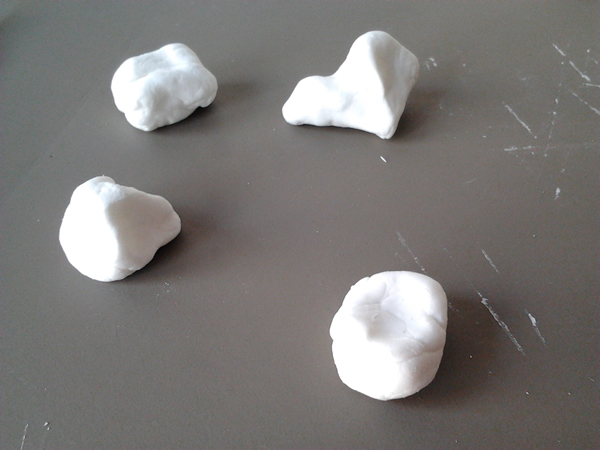 At the same time I applied the codical way: I started from six parameters of shape, and thus tried to make a shape. That brought me to new shapes, so again I worked more randomly. Next I examined hundreds of images to look at the most important or significant shape characteristics. Compared to the research of others I finally came to these six polar parameters: order/chaos, rough/smooth, sober/overload, vertical/horizontal, fat/thin, square/round. I did a lot of testing and sampling with it. The aim of this experiment is also to see if indeed these six parameters are sufficient to classify all shapes. With the 200th shape I stopped. 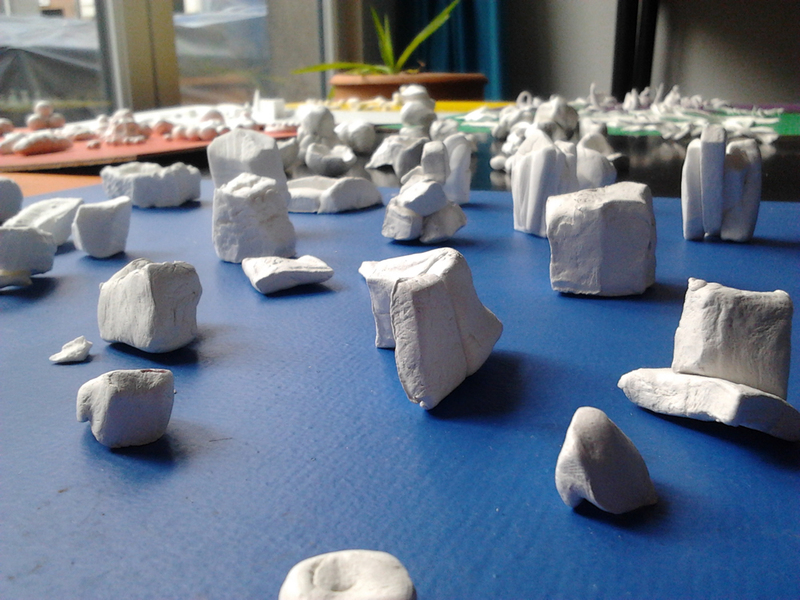 I now had a sufficient number to build up the shape space. I first tried to place a shape near a shape that had only one parameter different. I could sustain this way for a while but soon I ran into problems. I had created clouds of cohesive groups but could not satisfactorily join the groups together. There were clear conflicts. I needed structure to not get lost in the forest of shapes. The cube model seemed suitable to orient the shapes according to their parameters. This went well for a while. Is there such a thing as a gray shape? Meanwhile, I had another problem to handle. I had noticed that while building up the space a lot of shapes could be placed at the outer planes of the space. Because I wanted to compare the shape space with a colour space, raised the problem how the gray shapes looked like. Namely those located at the centre of the space. In a software program I made four animations through morfing with the most extreme shapes as opposites. Problems with the structural model. 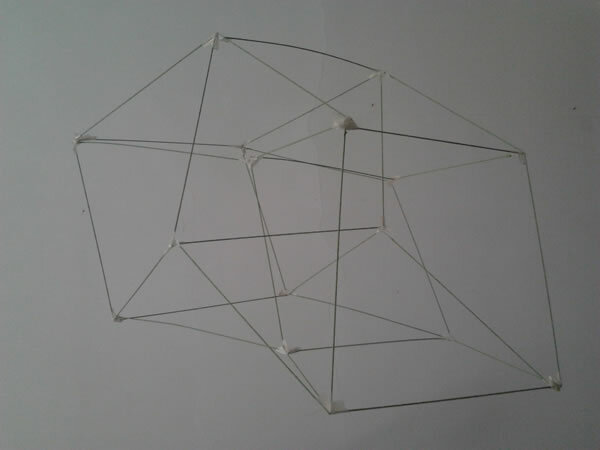 It soon became clear that the cube model for the shape space that I utilized roughly did not met the requirements. A cube has three dimensions and there are thus at least three too little, I noticed more and more with every shape I tried to ad. There were problematic inconsistencies in the transitions between shapes. Six parameters thus, but now what? So I came on the 4th dimension. It is actually a doubling of the cube, therefore, a doubling of the three dimensions = 6. 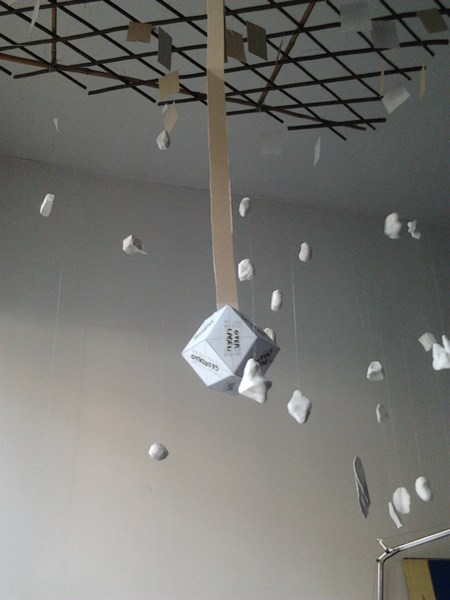 I took the rhombus dodecahedron as a model. It is also called the super-cube. I tried to make this strange piece of geometry in the real 3-D world. The way to this yielded unexpectedly beautiful shapes, as you can see on the picture. It remains an elusive but extremely fascinating shape. The 4th dimension is also mentioned as the time. The version I apply here is the math version. 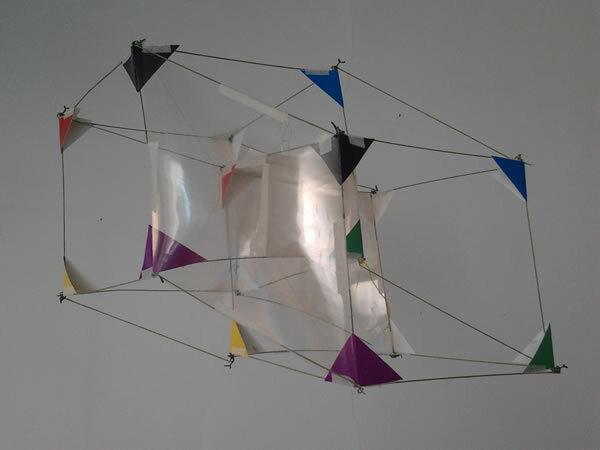 I have replicated a version of it in paper and hung it like a compass in the centre of the space. See photo. Unfortunately, the compass with the 12 faces of the super-cube, and the 2×6 polar shape parameters, did not work out. I could only place a limited number of shapes. In retrospect I can see why. A shape that we make always responds to the laws of the 3-dimensional space. There is a depth-height-width aspect. Even though the space in the 4th dimension is mathematically possible. I kept on searching, and found. We continue in the 4th dimension, but not by putting the parameters on the sides of the rhombus dodecahedron. My solution is now that I place the shapes on the dimension that was added to the three dimensions of the cube, and that connects the doubling cube. Pretty complicated I guess. But it works, I now have 64 possible connections from the 1st to the 2nd cube. 64 = 2 to the 6th power. 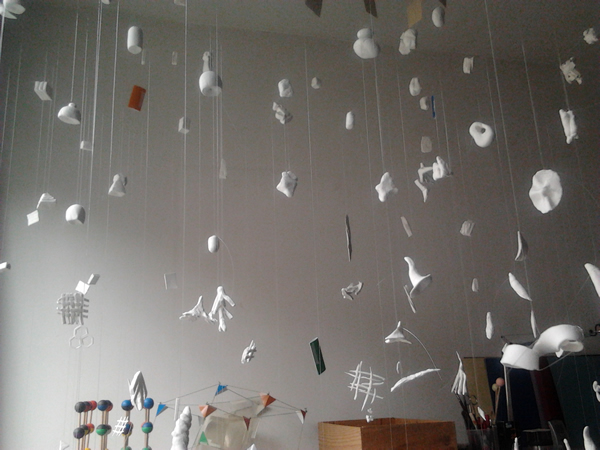 I have then again rearranged the space frantically on the basis of this new model of which I show a photo. For reasons of clarity I have given the vertices of each cube eight basic colours. Each colour codically matches with three shape parameters. The colours in the first cube represent the first group of 3 shape parameters, the colours in the second cube the remaining group of 3 parameters. Now it was only matter to combine the basic colours, to lay connections between the first and the second cube. I have reconstructed the coloured vertices in the shape space, this way I got a different kind of compass. This model has turned out to be superior to the previous ones which I had tried. However, I see now that there will always be conflicts. 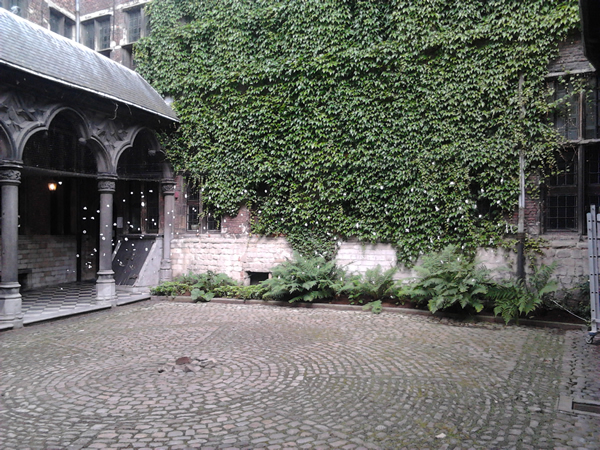 This shape space, as the result of my experiment containing more than 160 shapes, was installed in the Hofstraat 15 in Antwep centre, near the City Hall at the Grote Markt, during an exhibition of artistic work from students of the department In Situ3, Academy of Fine Arts in Antwerp. It is possible to make a space wherein all shapes find a place. A compact space shape can not be constructed in the real world, but it is possible in a virtual world. In the real world a possible approach is the use of the super cube as spatial structural model. The experiment has not ended. What is the connection with colour? Is there anything like basis shapes as there are basis colours? What is the connection with meaning? Next Is language genetically coded?